Melbourne-based designer Ash Allen recently won the sustainable and waste-wise design award at Fringe Furniture (part of the Melbourne Fringe Festival) for his Sticks and Stones outdoor stool. Allen was inspired by two elements of a Japanese rock garden – a naturally worn “skipping” stone and bamboo stems. The stool sits on three lightweight Tasmanian Oak legs (sticks) with a heavy cast “stone” seat above that incorporates recycled rubber crumb for texture and toughness. The stool is designed to pack flat to ship and does not require glue or tools to be assembled. The stools come in red, blue, grey and white, with or without rubber, and there are also matching side and coffee tables. 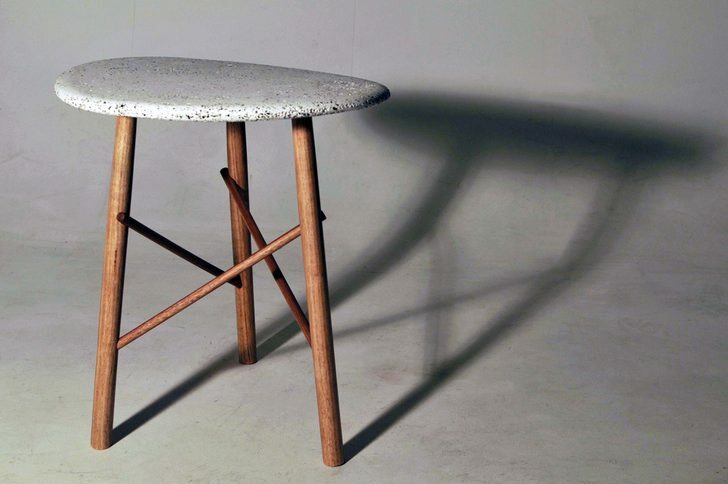 Sticks and Stones stool by Ash Allen.